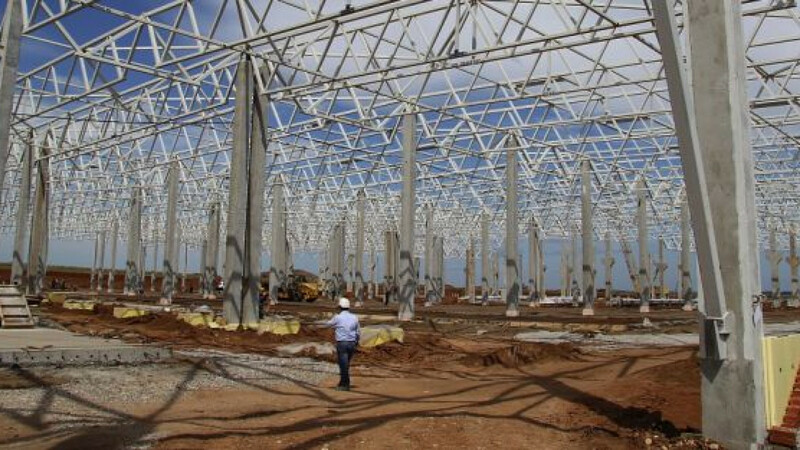 Construction of a plant belonging to Turkey’s Hayat Group in the special economic zones in Alabuga, Tatarstan. From next year, responsibility for Russia's special economic zones — key institutions that have proved an invaluable boon to domestic and international companies investing in Russia — may be transferred from the federal to regional governments, a news report said Friday. The decision to delegate management of the zones was reached in late May at a meeting under Deputy Prime Minister Dmitry Kozak, business daily Vedomosti reported, citing two officials familiar with the decision. The Economic Development Ministry confirmed that the decision had been taken. Kozak's spokesman told the newspaper that the shake-up will have to be approved by the government before coming to fruition. The special economic zone project was launched by the Economic Development Ministry in 2005 and has bloomed to a total of seventeen zones across Russia, which offer tax benefits, customs benefits, simplified registration procedures and other preferential treatment to investors. Crimea is expected to become Russia's eighteenth special economic zone, following the annexation of the peninsula from Ukraine in March. Up until now, the federal government has been responsible for opening the zones and allotting funds for construction of necessary infrastructure, while a state-run company — called Special Economic Zones, or SEZ — manages the territories through regional subsidiaries. Federal funds have paid for about 70 percent of the zones' infrastructure, Yulia Stefanishina from consultancy KPMG told Vedomosti. As of April 1, a total of 70.7 billion rubles ($2 billion) had been lavished on building infrastructure for the zones, according to the Economic Development Ministry. Instead of giving funds directly to SEZ, the federal government will now provide the regions with subsidies for developing the zones, Vedomosti said, though the federal government will retain the power to approve or veto the creation of new zones. Regional governments will be required to submit a set of targets for their proposed zones to Moscow, and if they do not achieve their aims, they will be forced to repay the federal subsidies, a representative of the Economic Development Ministry said. The criteria for judging a zone's effectiveness will also change, he added — while before they were evaluated according to the number of residents they attracted, the new benchmarks will be the number of high-technology jobs they create and their contribution to the region's economy. All existing commitments to investors, including promises of land in the zones and anticipated infrastructural development, will be transferred to the regions, the ministry representative said.